Click on the button below for a live link to our accelerated quality assurance testing. A prominent issue faced by the solar thermal energy field is the overheating of systems under stagnation conditions. These conditions are considered to be any period when the solar collector cannot transfer requisite heat to the heat transfer fluid (HTF) flowing through it, resulting in an increase in the temperature and pressure of the solar system above desirable levels. Stagnation can occur during power failures, component failures, or periods where there is minimal heat removal from the solar thermal loop. While the magnitude of stagnation temperatures depends on climatic conditions, even mid-temperature flat plate collectors can reach well over 150 degrees celsius. 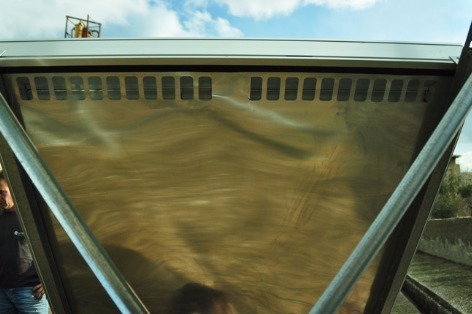 This intense heat can lead to several problems for a solar thermal system and its users, including the deterioration of the HTF, fouling of the pipelines, excessive pressure on the HTF loop, degradation of absorber coating in the collectors, and user damage due to scalding temperatures. Furthermore, because of the damage stagnation causes to a solar thermal system’s components, it can ultimately decrease the thermal performance of the system and jeopardize both its utility and lifespan leading to system failure. For a more complete discussion of the potential hazards of stagnation in a solar thermal system, click here. Coming up with an answer to the problem of stagnation is of significant importance to solar thermal manufacturers and users. ​Here at QSBR Innovations, we have designed a passive stagnation control technology to solve the issue of stagnation at the source. After extensive testing, it was determined that the best way to control stagnation temperatures is to incorporate a channel that when open allows ambient air to flow through and cool the collector. To accomplish this, a valve design was created and tested to provide optimal performance at a minimal cost. The valve is controlled by a shape memory alloy (SMA) spring, which opens the valve when the temperature in the air channel reaches a pre-determined actuation temperature* and closes when the temperature drops below that value. Two bias springs, one at each end of the valve, supply a restorative force to keep the valve aligned. When the valve is open, ambient air flows through causing heat to be removed from the collector, capping the temperature below stagnation conditions. Since the valve is closed when the collector temperature is lower than the actuation point of the SMA spring, it simply acts as an additional insulating layer against heat loss, and the collector exhibits “the thermal properties of a high performance solar collector” [r]. *Note: for optimal performance, the actuation point of the SMA spring should be between 90-100 degrees Celsius. The top opening of a valve-controlled air channel in one our solar collections outfitted with ISC technology. Creating a passive temperature control was a particularly important feature of the implemented design. Since the valve is opened and closed by a spring that expands and contracts depending on the temperature, it does not require any active management, user intervention, logic, or power source to function. Furthermore, the reliability of SMA springs has been confirmed by their use in the auto and space industry. While the valve is currently undergoing quality assurance testing, it has already completed several thousands cycles without complication. With the conservative assumption that the valve opens daily over the course of a solar thermal collectors lifetime (25 years), the valve should be able to complete almost 10,000 cycles. Given the results we currently have, it is unlikely that the valve will require maintenance over a collector’s lifetime. Since the valve is closed when the collector is below stagnation temperatures, it simply acts as an additional insulating layer against heat loss. When the valve is closed, tests have confirmed that the heat loss of a flat plate collector fitted with an ISC valve is identical to a test collector. When the channel is open and ambient air is permitted to flow through, the collector is able to transfer its heat to the air, which is then replaced by cooler air due to natural convection. Results have shown that in a flat-plate collector outfitted with an ISC valve, heat loss is significantly increased over 100 degrees Celsius - the temperature where the valve begins to open. Since there are many harmful problems associated with unconstrained stagnation temperatures, the inclusion of ISC technology in a collector’s design can go a long way to increasing the lifetime and performance of a solar thermal system. A video displaying 5 cycles of our accelerated quality assurance testing. Please note that the speed of the video has been increased x8 for your convenience. For a live stream of the testing, click here. ​In order to ensure the reliability of the current ISC valve design, it is undergoing accelerated quality assurance testing in the Solar Calorimetry Lab at Queen’s University in Kingston, Ontario. A heat gun and fan are both positioned a few inches away from the SMA spring that simulate heating up and cooling down of the air channel, respectively, during a given day. Two infrared reflective sensors are positioned in the valve's opening and detect when the valve is open or closed. They then send corresponding signals to an Arduino. Depending on the signal received by the Arduino, a relay switch is turned on for the heat gun or fan to open or close the valve. Also connected to the Arduino is an LCD screen that displays the time and cycle count of the current test. ​Thus far, the valve has undergone several thousand cycles without any complications. Please check back in a week or two when testing is done for a more complete discussion of our results. A counter that tracks the number of cycles performed by the test valve is updated daily and can be seen to the right.